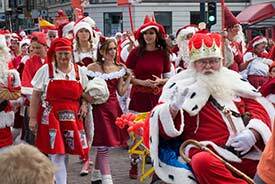 ABOVE: A summer parade of Santas on Str�get, Copenhagen's main shopping street. INSET BELOW: Copenhagen's Danish spelling on a boat fantail, and a navigation light in the Frihavnen cruise harbor. Copenhagen, Denmark--Scandinavia's largest city--has been called "The Paris of the North." That may be an exaggeration, but it's an understandable display of hyperbole in a part of Europe where joie de vivre is occasionally smothered under a blanket of earnestness. This is a city where the Queen designs opera costumes, gay marriage has been legal since 1989, and Santas parade through the streets in July. Copenhagen's tourist attractions range from the world's oldest amusement park to royal palaces. On the museum scene, you can choose anything from a museum of the Danish Resistance to an open-air museum with rural buildings from all over Denmark. Shopping offers a plethora of opportunities, from amber trinkets to Royal Copenhagen Porcelain or Georg Jensen silver to Danish modern furniture. And when you're hungry from looking at countless empty Flora Danica plates, you can head for one of Copenhagen's more than 2,000 restaurants to enjoy sm�rrebrod with cold Carlsberg beer or a five-course French feast. 1st inset photo copyright © Lone Elisa Ploughmann.